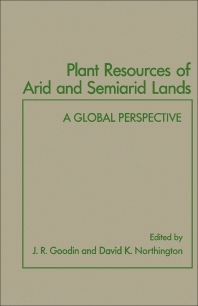 Plant Resources of Arid and Semiarid Lands: A Global Perspective is a collection of papers that evaluates the existing native plant resources in the arid and semiarid regions. The papers deal with the resources found in these arid regions such as food potential, forage, fuel, fiber, medicinal or industrial uses. The book covers the arid regions of Africa, Australia, the Indian subcontinent, Middle East, North America, China, South America, and the USSR. The treatment of these regions includes geographical descriptions such as area, annual precipitation, temperature, humidity, wind ranges or patterns, and seasons. These papers also discuss the effects of topography on water drainage and loss, the basic soil types, holding capacity, water runoffs, and the availability of water (surface and subsurface), The book examines the current and projected growth rates for relevant countries and dry regions in each continent. These papers discuss the economic output from arid lands, the balance of trade, current or developing resources, as well as the prospects of these countries with dry regions. The book also focuses on the types of plants found in these regions whether these are used for food, forage, medicine or for industry. This collection is suitable for environmentalists, ecologists, sociologist, anthropologists, and researchers involved in biological and environmental conservation.